Back by popular demand! Thanks to everyone who commented on my posting last week. It’s always great to know that so many people are interested in nutrition and healthy eating. Oatmeal, walnuts, and cinnamon. Here’s a great breakfast to kick off your day. Oatmeal contains a type of fiber called soluble fiber. Soluble fiber forms a gel in your digestive tract and by doing so, traps cholesterol, which you then excrete. The result is that you can lower your LDL (“bad”) cholesterol. The key, though, is to shy away from the sugary, instant oatmeal packets. Yes, they’re quick and easy to prepare, but because this type of oatmeal is so processed, it’s likely to spike your blood glucose afterwards. Ideally, go for steel-cut oats, which contain the whole oat kernel. I know they take longer to cook, but that way you can cook up a batch ahead of time and then heat it up as you need it. If you can’t manage steel-cut oats, you can eat rolled oats instead, although these have less fiber. 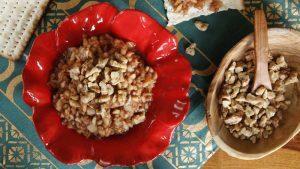 Once you have your oatmeal all set, add some chopped walnuts. Why walnuts? Walnuts contain a variety of nutrients that can lower LDL cholesterol, prevent platelets from clumping, decrease C-reactive protein (a marker of inflammation), and improve endothelial cell function (which is a marker of how healthy your blood vessels are). Oh, and walnuts are a source of omega-3 fatty acids, which are healthy fats that can lower triglycerides (a type of blood fat). Finally, sprinkle a bit of cinnamon on top. I’ve written a lot about cinnamon, so I won’t get into it too much here. Suffice it to say that in some people, cinnamon can help lower blood glucose, may help lower LDL cholesterol, and may even have antibacterial and antifungal properties, too. Hummus, garlic, and whole-grain bread. There’s nothing like a great tasting hummus. Hummus on its own is healthy, but you can make it even healthier by adding some garlic and spreading it on a nice slice of whole-grain bread. Not sure what hummus is? It’s a spread or dip made from mashed chickpeas, tahini, which is sesame paste, and various other flavorings. Chickpeas are high in protein and fiber (especially that soluble fiber), as well as folic acid, zinc, and magnesium. If you make your own hummus, which is easy to do, add some fresh chopped garlic. Garlic helps lower blood pressure, cholesterol, and triglycerides. The whole-grain bread (make sure the first ingredient on the list is truly a whole grain, like whole wheat or whole rye) contains nutrients such as protein, which “complements” the protein found in the chickpeas (similar to beans and rice). In addition, the combination of garlic with the whole grains in the bread helps iron and zinc absorption. Turn this combo into a sandwich by adding some slices of avocado (rich in monounsaturated fat) and a couple of tomato slices (high in the antioxidant lycopene). Steak and Brussels sprouts. This may sound like a strange pairing, but there’s a reason for it. Steak isn’t exactly the healthiest of foods, but it has its merits. Beef is a high-quality source of protein, and it’s rich in iron, zinc, selenium, and B vitamins. Splurge a little, if you can, and buy grass-fed beef, which has less total fat, more omega-3 fatty acids, more antioxidants, and more conjugated linoleic acid, a substance that may lower the risk of heart disease and cancer. However, if you prefer your steak well done or even charred, harmful substances that are thought to be carcinogens are formed. It’s best not to char or blacken your meat, but if you do, trim off the blackened parts and consider eating a healthy portion of Brussels sprouts (or broccoli or cauliflower) along with that steak. Cruciferous vegetables contain an antioxidant called sulforaphane, which may help the body get rid of those carcinogens in the blackened steak. Don’t like Brussels sprouts? Try broccoli sprouts, which are next to alfalfa sprouts in the produce section. They have even more sulforaphane than broccoli. Yogurt, raspberries, and ground flaxseed. We know yogurt contains calcium, vitamin D (typically), and protein. But yogurt is also a source of probiotics, which are good bacteria that provide numerous health benefits, such as improved immunity, relief from irritable bowel syndrome, and prevention of yeast and urinary tract infections. Probiotics need to eat too, however, and that’s where the raspberries and flaxseed come in. Berries and flaxseed contain prebiotics, which are indigestible (to people) nutrients on which probiotics feed. Inulin, polydextrose, and lactulose are examples of these nutrients. Also, berries and flaxseed contain heart-healthy fiber and antioxidants that promote heart health. Pasta and balsamic vinegar. I realize that many people with diabetes shy away from pasta. But hear me out. White pasta, when cooked for 5 or 6 minutes, has a glycemic index (GI) of about 38, which is considered low. Keep cooking that pasta, however, and the GI rises considerably. Part of the issue with pasta may be the portion size. Obviously, a plate piled high with fettuccine is loaded with carbohydrate, so at that point, the GI pretty much doesn’t matter. Treat pasta more like a side dish and consider eating it “primavera” style, which means adding a lot of vegetables.